PALM SPRINGS, Calif. — The first game of the day at Palm Springs Stadium featured the Washington Blue Sox and Coachella Valley Snowbirds, with the Snowbirds winning, 5-4. Seven of the nine total runs scored in the game came in the first inning, as both teams sent nine men to the plate. The inning ended up taking over 30 minutes and featured a combined four errors and seven walks. In that wild first inning, it was the Blue Sox (9-7) who got the scoring started. KC Huth walked to lead off the game, then stole second base and scored on two throwing errors all on the same play. Kyle Stahl followed with an RBI single later in the inning, and Nicholas Ivone drove in the third run on a ground ball that turned into an error. But the Snowbirds (4-11-1) answered quickly, getting their first four hitters on base to start the bottom of the first. Taichi Nakamura hit an RBI single, Tauya Okamato brought home a run with a fielder’s choice grounder and Yueh-Se Chen added a two-RBI single to give the Snowbirds a 4-3 lead after the first inning. Only two runs were scored the rest of the game. The Blue Sox tied the game 4-4 on another RBI single from Stahl in the third, but Coachella Valley took the lead back for good when Kuo-Chen Tseng scored on a passed ball in the fourth to make it 5-4. Fu-Yuan Chang started for the Snowbirds and got the win, while Yuta Kikuzaki got the loss for the Blue Sox. Michihiro Koizumi and Jae Soon Lee combined for three perfect innings out of the bullpen, with Koizumi getting a hold and Lee earning the save. 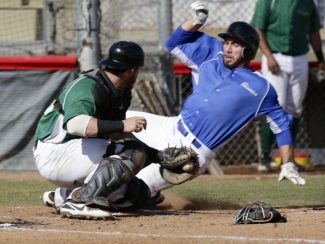 The Canada A’s scored eight unanswered runs to ride an 8-3 win over the Palm Springs Power on the final regular season contest of the 2018 California Winter League season. The Power (9-5-1) got on the board in the first inning after three of the first four batters reached. Christopher Scalisi and Hayden Mahe-Liessmann scored on a Stefano Belmonte base-hit. Belmonte later scored on a two-out single by Cletis Avery to go up 3-0. That would be all for the Palm Springs offense, as three A’s (9-6) pitchers combined for six shutout frames the rest of the way. Canada got two runs back in the second inning on a Michael Marlin homer. Then, in the third, Tyler post walked, stole second base and scored on an Alfonso Reda single to tie the game at three. The A’s would grab the lead in the fourth and never look back. Mike Hardin doubled and was driven in on an RBI triple from Jake Luce. Grote quickly followed with a sacrifice fly to score Luce, and Tyler Post eventually reached and scored on an error to give the A’s a 6-3 edge. Two insurance runs scored in the sixth for Canada and Alfonso Reda shut down the Power in the seventh to officially conclude regular season play. Thomas Goodyear started for the A’s and got the win after allowing three runs in three innings pitched. Payton Lobdell took the loss following his two innings of work. Hardin finished his afternoon 4-for-4 with a double and two runs scored. On the auxiliary field, the Toronto Rush (9-6) defeated the Manitoba North Stars (9-6-1), 5-0 in four innings. Raul Shah doubled and drove in two for the Rush in the victory. The game will not be considered official. In game two, the British Columbia Bombers (3-11-2) beat the Oregon LumberJacks (9-6-1), 12-1. 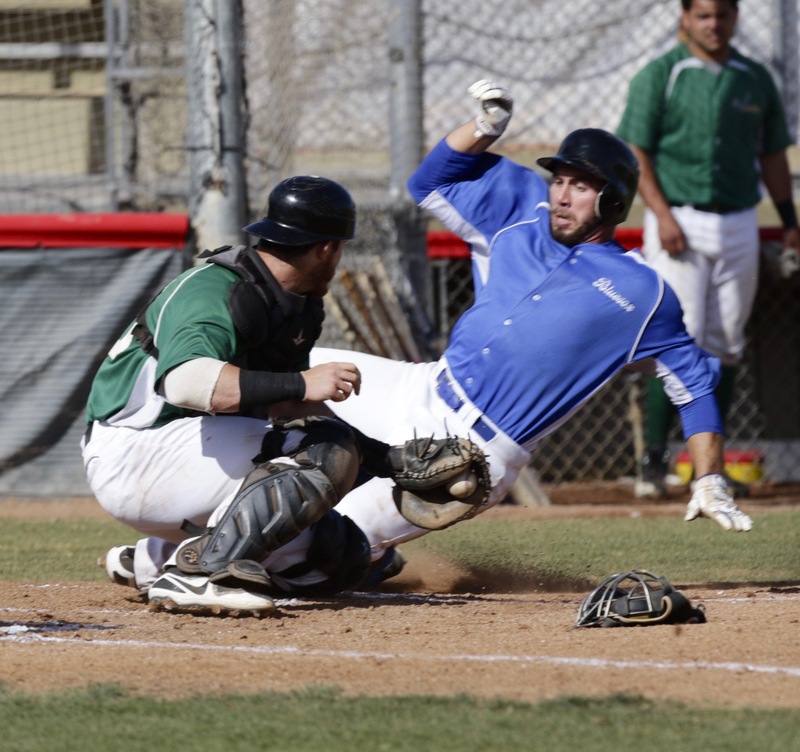 The final contest of the day ended in a 5-1 win for the Palm Springs Chill over the Alberta Grizzly in four innings. The win for the Chill and loss for the Grizzly will not have an effect on each club’s record. Wednesday, February 14 will be a workout day for all ten California Winter League teams before postseason play begins on the 15th. The first matchup will be played at 10:00am, with another to follow at 12:30 at Palm Springs Stadium. Thursday, February 15 is “Out-of-Towners Day” at Palm Springs Stadium. Those with a valid out-of-state ID will be admitted to the ballpark for just $3. Those not in attendance can listen to the postseason call on CaliforniaWinterLeague.com.